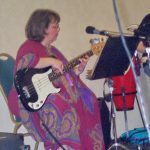 Only three of the five founding members of the BBB were involved in this performance, but had it not happened—or not gone acceptably well—the band might never have come to be. 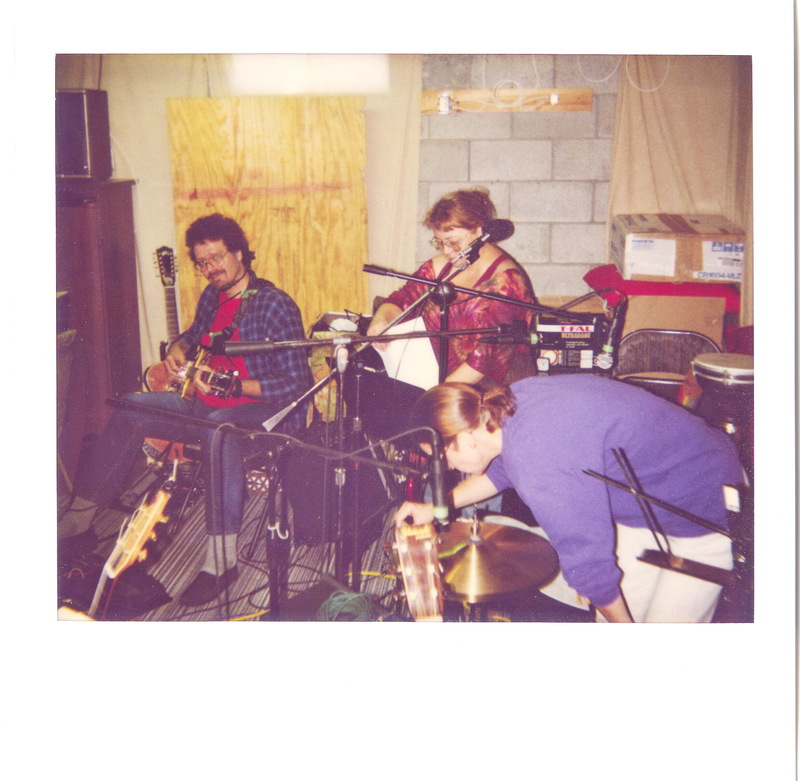 Mary Ellen, Mike, and Gwen had been making music together informally in Mew’s Shy Filkers Circle and in each others’ homes. 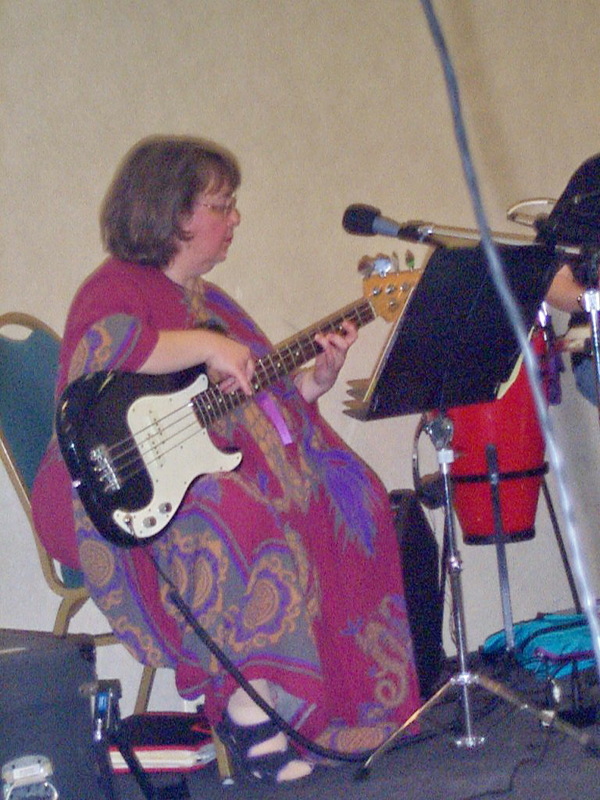 Mew was a well-known filk performer with a big voice and a cheerful stage presence. 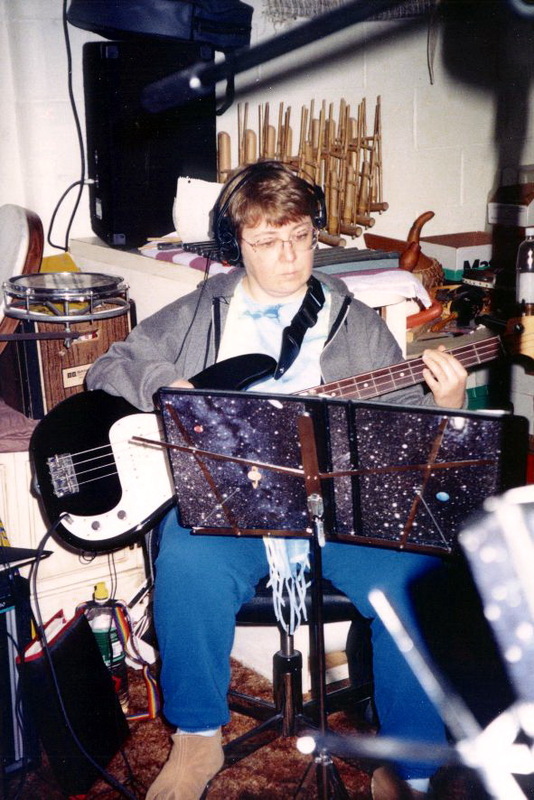 Mike had done some studio work (synth, viola) for Barry & Sally Childs-Helton’s album Paradox, and Gwen and Mike both had contributed to Kathy Mar’s albums for Thor Records. 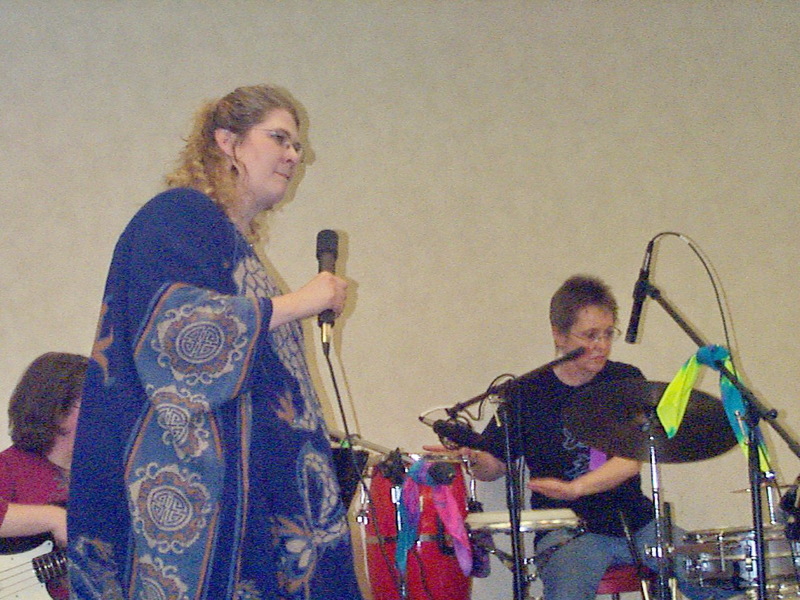 All three had been part of Mark Bernstein’s Heinlein-tribute choir at OVFF IV, and Mike had reprised his synth work in concert with Barry & Sally that same weekend. But it was still a bold (read: scary) step to try to fill a concert slot with what we came to call the “3 of 5” lineup. So we recruited a fourth member, Roland. Mike’s Roland D-20 synthesizer, that is, which performed four of his MIDI compositions in the course of the set—an experiment we quickly regretted, since Roland proved to have zero stage presence. There’s a one hour rehearsal/practice tape, but no known recordings of the concert—which may be for the best. Roland still remembers all his songs perfectly, though. 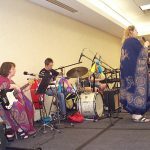 The idea that became The Black Book Band was of a “common hymnal” for the new influx of electric players in filk music. 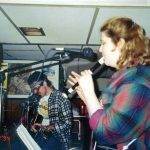 The ‘black books’ would contain songs that everyone knew (or would learn) for Sunday afternoon jams and an ever-changing concert lineup. A first approximation was planned for Marcon XIV in 1990—a concert comprised of three five-song mini-sets (Barry & Sally, Mike & Gwen, Mew) with the various players backing each other up. Eleven of the fifteen songs on the set list were folk or rock covers (“found filks”), plus two of Barry’s tunes and two true filks. There’s one hour of rehearsal tape, and a partial concert tape (source unknown). 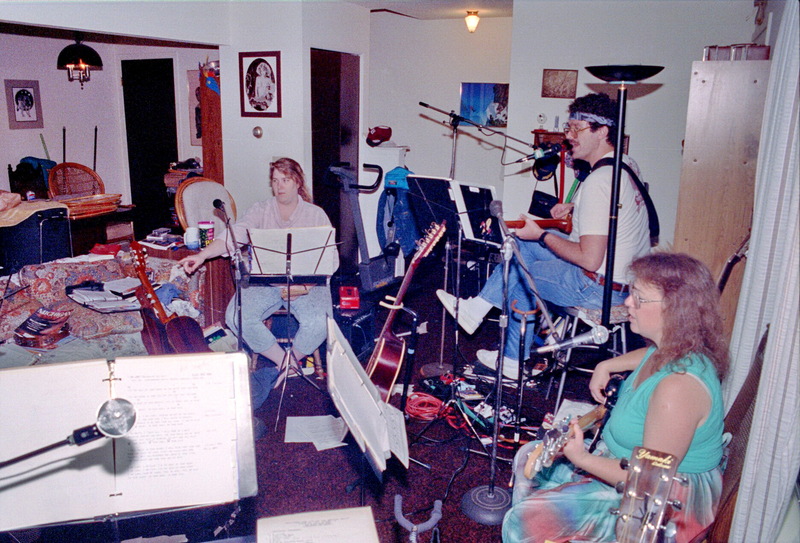 A few weeks before showing up at Marcon to perform for the first time as The Black Book Band, we met for the first iteration of what would become a BBB tradition—taking over someone’s home for a long weekend of intensive woodshedding. 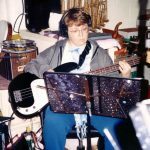 In a living room or basement crowded with instruments, amps, mic stands, music stands, and cables, we’d try out tunes and hammer out arrangements, work up harmonies and practice entrances and exits. It was never enough time, so we recorded our semi-polished takes so everyone could continue to work on weak spots at home. The tapes give evidence of the remarkable lack of conflict that was a hallmark of rehearsal weekends—as well as the good humor everyone brought to our getaways, and the late-night sillies that descended on us. 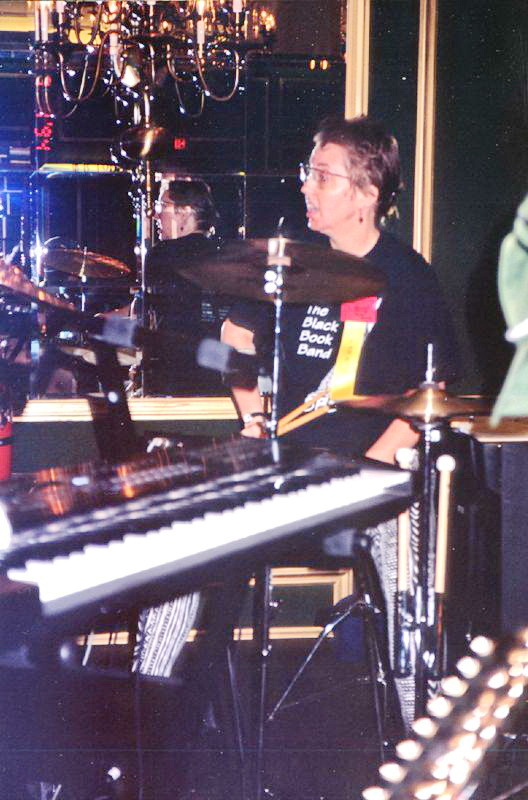 Much of the joy of being in the Black Book Band would come from these musical marathons. We joked that the concerts were just an excuse to get together and make music—and there was some truth to it. 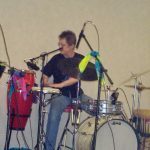 We opened our debut concert with an uptempo “Thanksgiving Eve” (Bob Franke) and closed it with the first performance of what would be one of our most popular numbers—Barry’s “Sailplane.” Barry’s songwriting contributions also included “Whistling in the Dark” and ‘Small Designs.” The set included the first and last BBB takes on two “3 of 5” tunes, “After the Gold Rush” and Claudia Schmidt’s “Blessing,” plus the oddest encore we ever offered: a rolling reggae-fied “Kiss the Girl” (from The Little Mermaid). 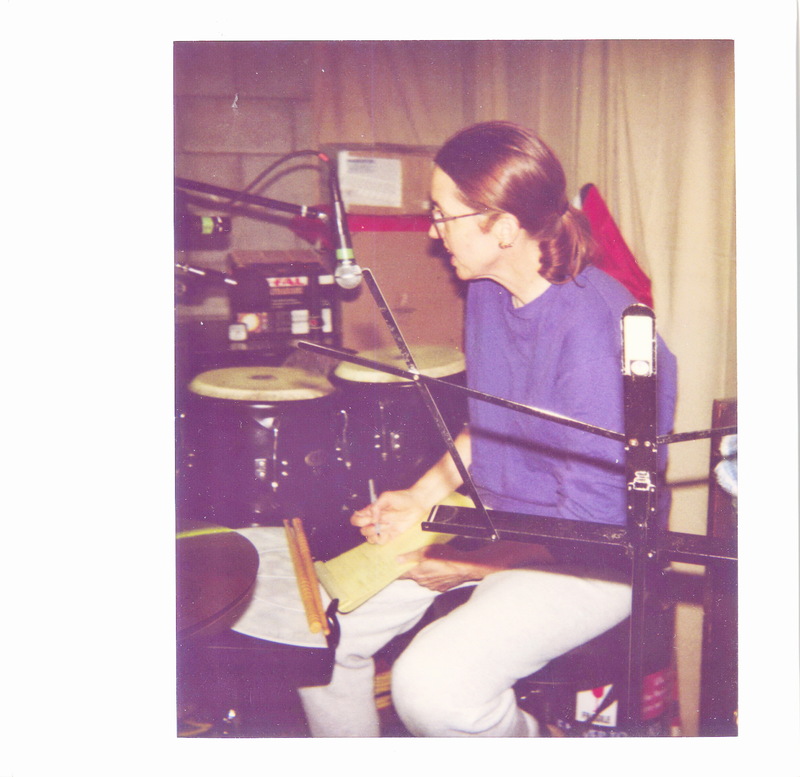 There are about four hours of rehearsal tapes, plus a stereo concert recording from Sally’s Marantz field recorder (ethnomusicologists rule!).. 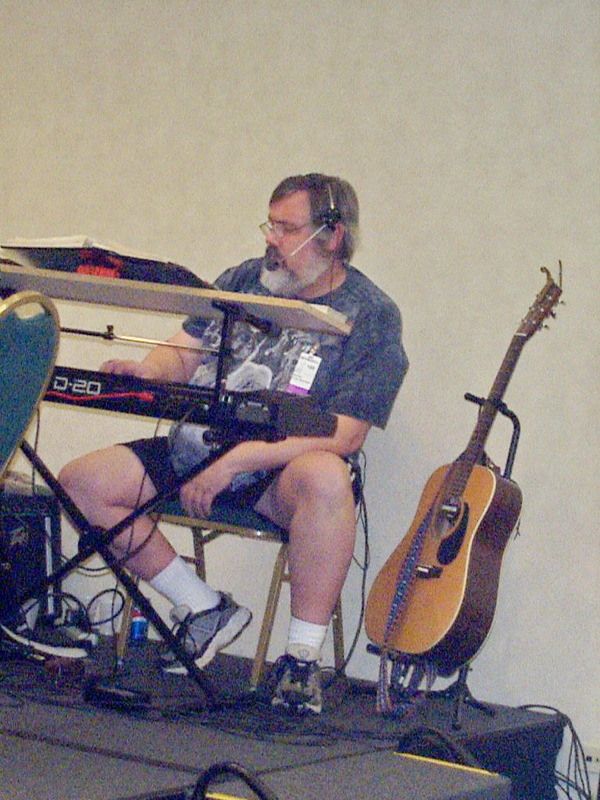 Mike doesn’t remember how the BBB ended up with a featured concert at Worldcon. 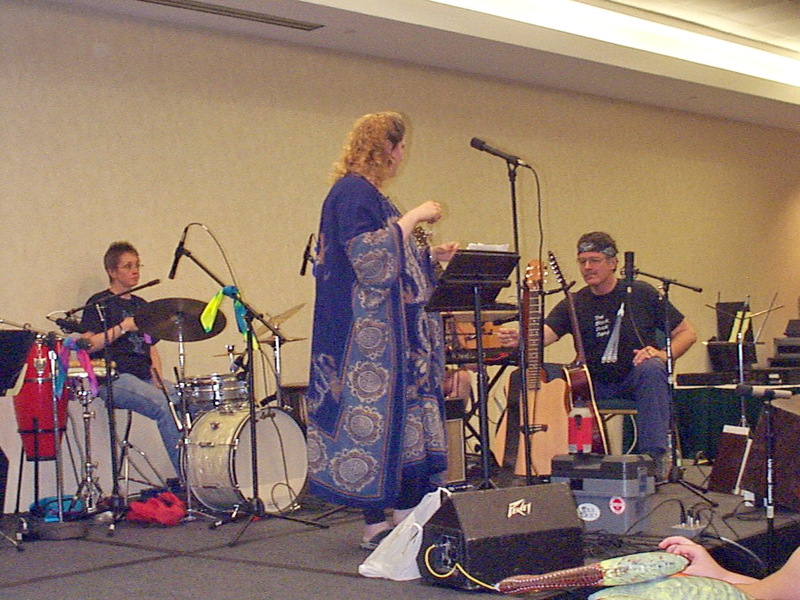 In the absence of a contrary account from the rest of the band, he guesses that a filk friend on the Chicon committee had a seizure while attending the Marcon concert. There is no forgetting how earnestly we approached the opportunity. 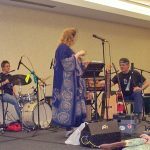 Worldcon is fandom’s biggest stage, and there was the possibility that anyone who was anyone in filk might be in the audience. The rehearsals were long and intense. The set list was expanded from 10 to 18 numbers, plus 3 prepared encores (because of the length of the set, just 1, “Brown-Eyed Girl,” was used). Only 6 songs were repeats from Marcon; 4 were “3 of 5” repertoire; 9 were BBB debuts. The last group included our uptempo “Hope Eyrie,” which was our closer and would find a permanent place in our sets. Two very different tunes, Kathy’s “Give My Children Wings” and Joel Mabus’s “Hitler Was a Vegetarian,” would prove to be one-offs. The room was packed, and the energy coming back from the audience was gratifying. 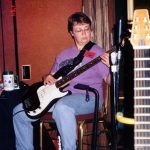 Our personality wasn’t yet fully formed, our repertoire wasn’t highly polished, and our gear had shortcomings (we had no monitors, for instance). But Chicon is still a standout BBB memory. There are six hours of rehearsal tapes, a semipro recording by Wailsongs, and a band recording with the Marantz. Mike was Millennicon’s writer Guest of Honor, and he coaxed the rest of the band to come along for a Sunday afternoon concert. 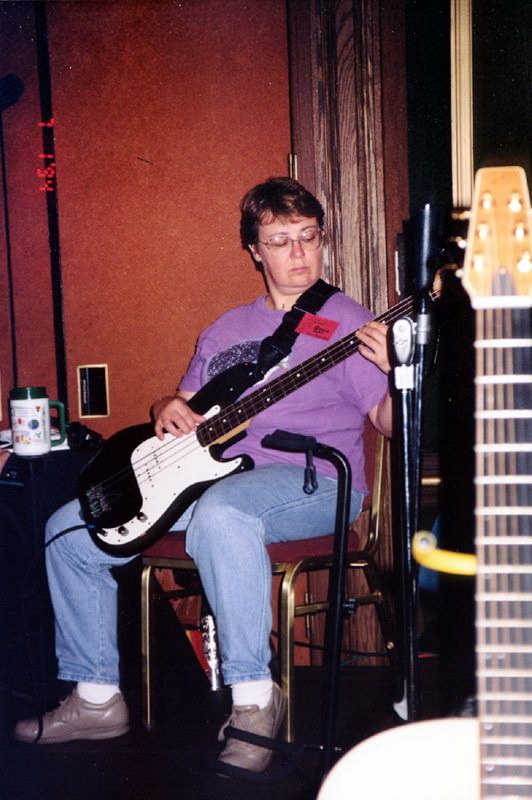 The 18-song set closely mirrored the Worldcon lineup, with 13 reprises and 5 debuts. Of the latter group, the most notable were the band’s melty “Madman on the Watchtower” and Barry’s “Monorail to Atomland,” both of which earned permanent spots in all concerts to come. There are 5.5 hours of rehearsal tapes, plus two single-point stereo concert recordings, one from Sally’s Marantz and one from Mike’s Walkmanesque Sony TCS-350. For our final concert of the year, we shortened the set list to 14 tunes and moved the needle on tone toward serious, dropping three humorous numbers and adding one angry one. This was the first concert with a majority of the set list (8 songs) later to appear on First Contact. 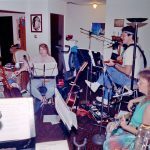 There are 7 hours of rehearsal tapes, including the first instance of another BBB tradition—closing out the weekend with a minimum-interruptions, full set list mock concert. The real concert was recorded on the Sony TCS-350 and by someone only known to us now as “LNZ.” The latter is much more listenable. 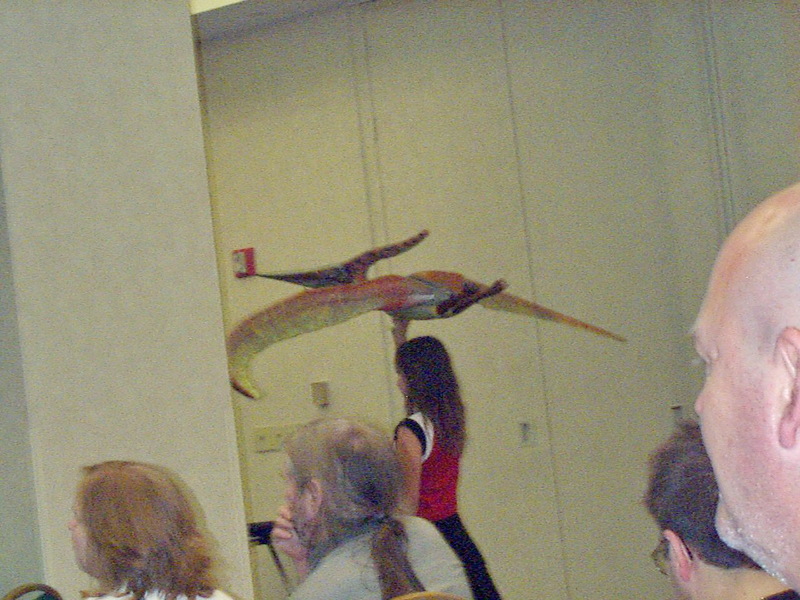 New at InCon were two parodies: our introduce-the-band version of “Secret Agent Man,” and “I’m Rodan,” a love song for atomic pterodactyls. Another debut was Barry’s “Lady Be Crazy,” with Mike playing lead for the first time on his double-neck Carvin. 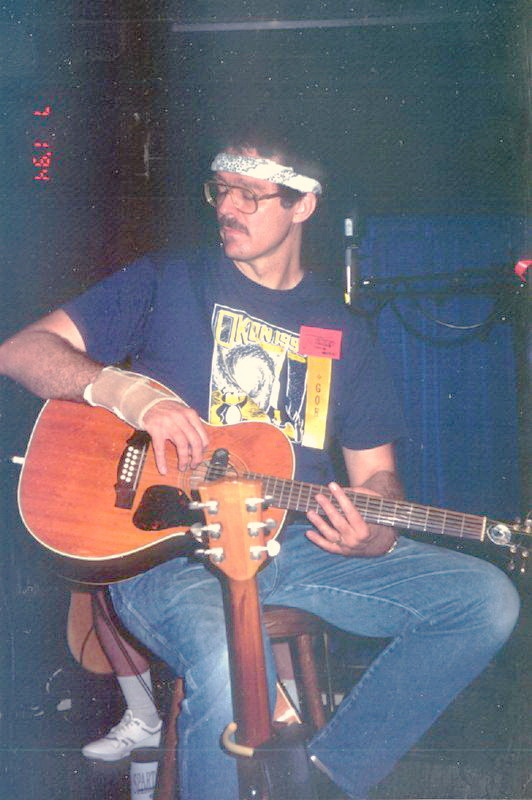 “Duct Tape Blues” was dusted off for one final appearance in a BBB set. There are only 2 hours of rehearsal tapes, plus a mock concert. 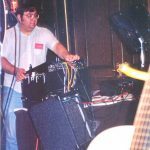 There are no known recordings of the actual concert, as Mike’s TCS-350 was stolen at the con. Once again, Mike was Guest of Honor and inveigled the rest of the band into coming along for the ride. The set showed we’d settled into an identity, with 12 future CD tracks in a 16-song set. 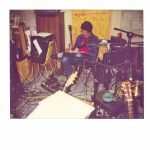 We leaned more heavily than ever before on Barry’s songwriting, with 6 numbers including our first performance of “Lightship Yarrow” with its beautiful Barry-Mew duet. Other new tunes in the set list were Marty Balin’s “Comin’ Back to Me” with Mike on viola, and our first pairing of “Harbors” with “Hope Eyrie” as a filk-anthem closer. For the first time, every song in the set was a keeper—all would remain in heavy rotation through the rest of our tour. Because the Contraption and Marcon gigs were so close together, we rehearsed for them together in two weekend sessions. There are 8.5 hours of rehearsal tapes, plus a 1.5 hour mock concert. 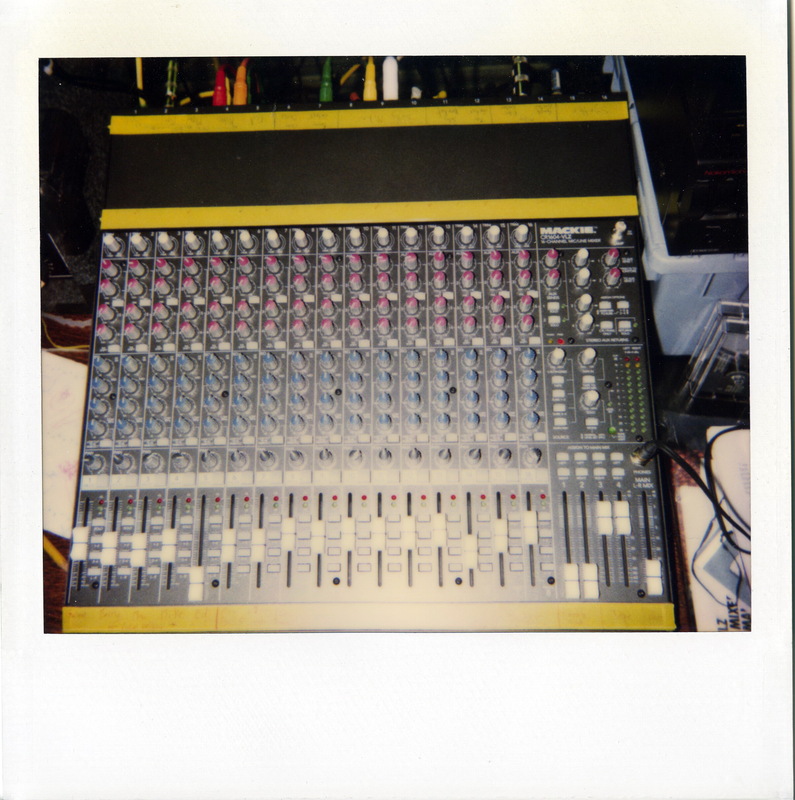 There’s a concert recording with the Marantz; this was also the first concert recorded by Bill Roper for the First Contact CD project. 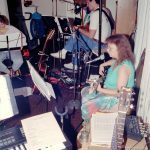 This was the only BBB concert in which we did not play “Sailplane.” Bill Roper again recorded the gig for First Contact. 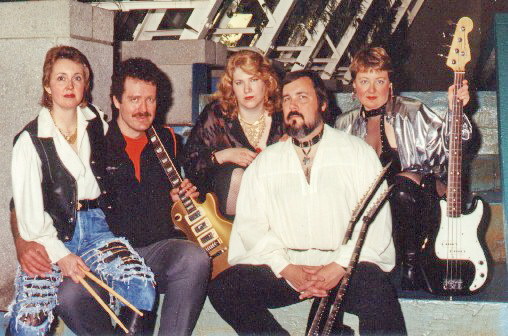 Band photos were taken on a flight of marble stairs not far from the food court. One appears on the back of the CD. There are 3 hours of rehearsal tapes, and an extended 2-hour mock concert. 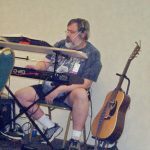 Bill Roper was present again to record the real concert for First Contact. 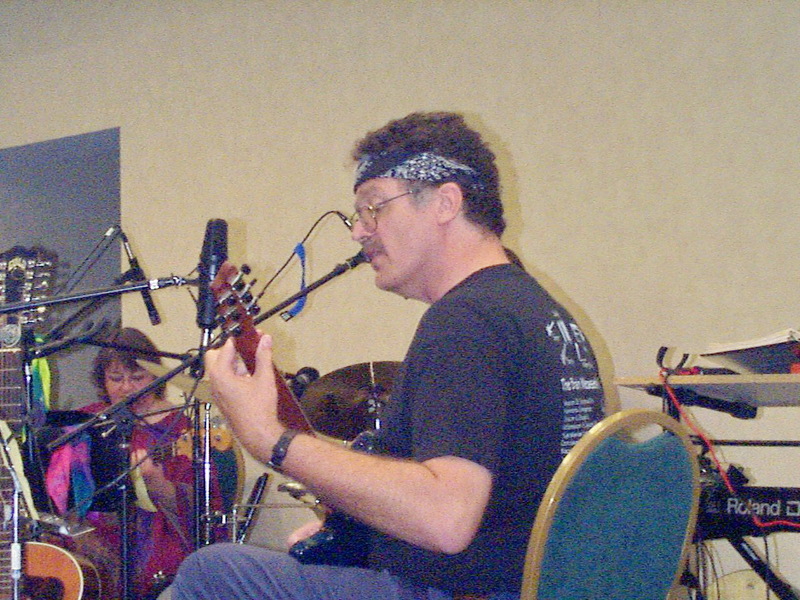 For the final concert of the Brain Weasels Tour, the BBB cruised through a 14-song set (with 11 CD tracks) before becoming the backup band to a parade of filk stars—Michael Longcor (“Building Fires”), Bill Sutton (“Six-String Orchestra”), and Kathy Mar (“Vapor Angels” and “White Rabbit”). The concert would have featured 12 CD tracks, but Mike’s over-the-top “I’m Rodan,” a staple since InCon in ’93, had to be left off the album when the humorless holders of the rights to the tune (“I’m A Man”) gave a hard No to licensing it. We took the stage as surprised nominees for the Pegasus Award for Best Performer, and went home as its grateful recipients. This was Barry’s third Pegasus Award (of 5 to date), Sally’s second (she and Barry shared Best Performer honors in 1988), Gwen’s first (she would also be lauded in 1996 for her song “Circles”), and Mary Ellen’s and Mike’s only (though Mew has amassed 7 nominations to date, six in the Best Performer category). Reflecting how comfortable we felt with our repertoire, there is only 1 hour of rehearsal recordings, plus a mock concert. 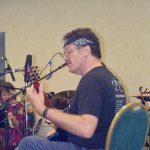 This was the final concert recorded by Bill Roper for Dodeka. First Contact was released on cassette in 1996 and CD in 1997. 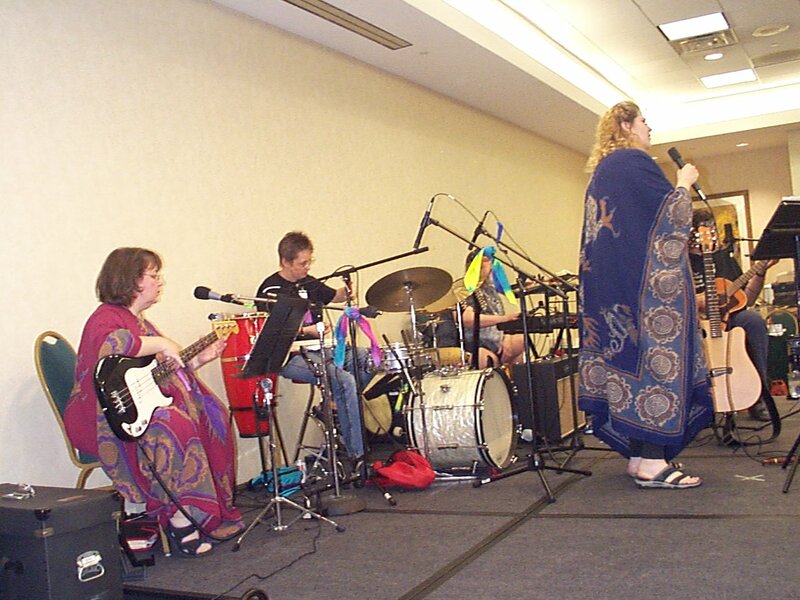 Though OVFF X was an incredible high point for the band, no one really wanted to stop there. The musical and personal chemistry were as strong as ever—we are all bound together as lifetime friends. But change was coming, nonetheless. By OVFF, Gwen and Mike were parents-to-be; they welcomed a daughter the following March, and a son in 1996. (Yes, Raven—that means you were on stage with us.) Not long after, following her own romantic call, Mew stretched the band’s Indy-Lansing-Ann Arbor rehearsal triangle to a much more problematic Indy-Lansing-Vermont. Traditionally one of the three major ‘Ann Arbor’ fan conventions, Conclave relocated to Lansing in 1995, taking up residence at a hotel just 15 minutes from Mike & Gwen’s front door. 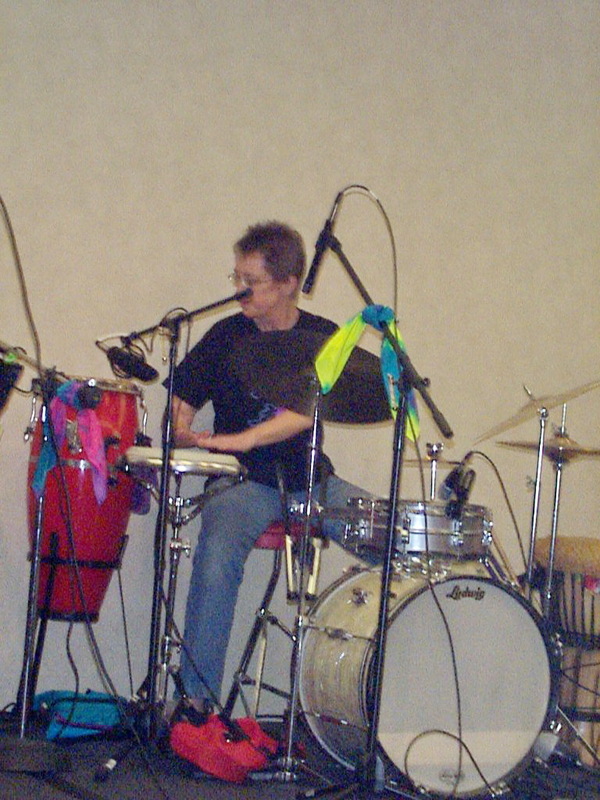 That made possible a spontaneous and unbilled acoustic set in what was ostensibly Barry & Sally’s concert slot. There are rumors that Mike, Gwen and Mew weren’t even wearing membership badges. But there are no known photos or concert recordings, so perhaps it never really happened at all. 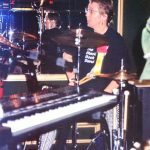 In October 1997, Alan Theisen, chairman of the upcoming Consonance in Milpitas, CA, made a bid to make the first and only West Coast appearance by the Black Book Band a reality. 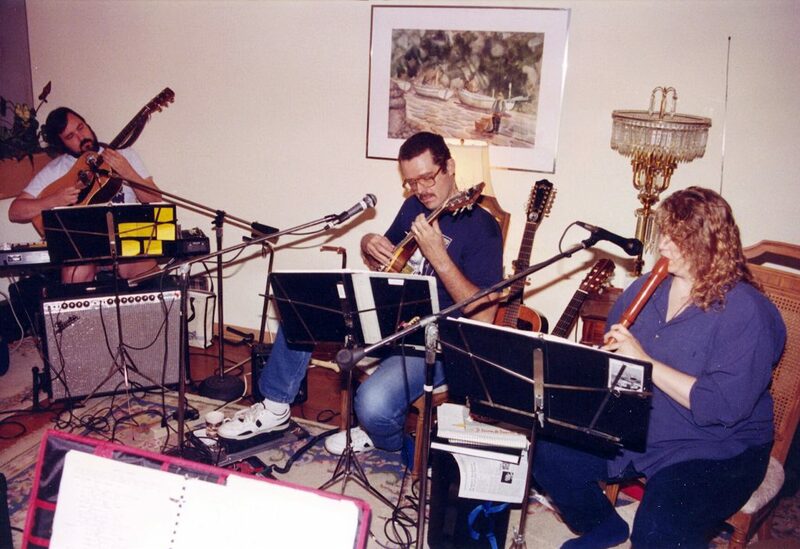 Barry & Sally were already slated as Guests of Honor, and the con invited Mike, Gwen and Mew as special guests—generously including air fare, hotel room, memberships, and even an offer to arrange the loan of instruments and gear. 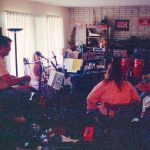 E-mail flew back and forth among the band members for a few weeks as Mike & Gwen wrestled with the prospect of traveling cross-country with a 2-year-old and a 1-year-old…or of leaving them home with someone else. But when Gwen’s Mom unexpectedly passed away on Hallowe’en, and Gwen had a scare of her own a month later, the sun set on our Golden Coast opportunity. 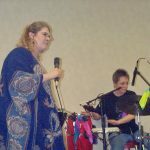 Four years after the Brain Weasels tour ended, the Black Book Band was invited back to OVFF as Guests of Honor. Even though in our home territory, the band’s first full-out reunion concert still posed logistical challenges. Mike & Gwen’s elderly Dodge Caravan, which had hauled All The Gear for every BBB outing since 1989, was no longer road-trip worthy. Mew was 800 miles away in New Hampshire with her future husband, keyboardist Ed Stauff. 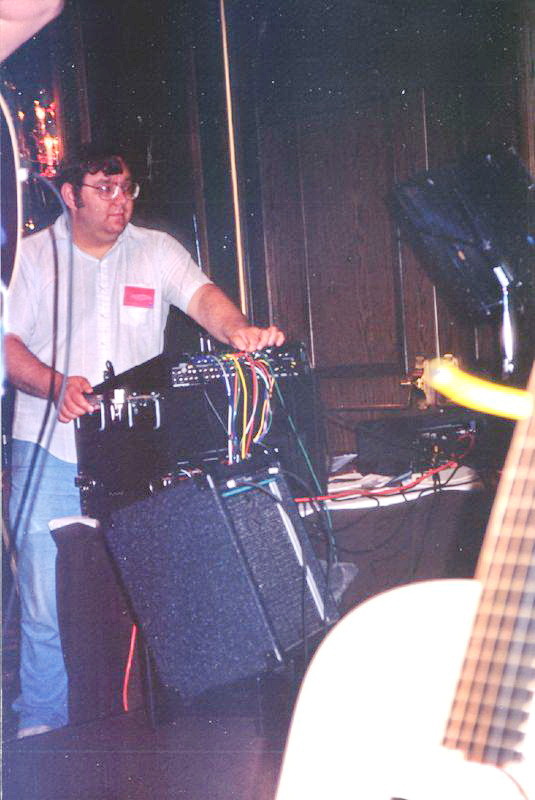 And without Bill Roper involved, we were short a couple of key pieces of gear for sound support. OVFF XIV would turn out to be by far the most expensive gig we ever played. With three weeks to go, Mike bit the bullet on a $900 16-channel Mackie mixing board, clearing the way for a final rehearsal rendezvous in Okemos. Mew’s Mom came through with a plane ticket to get her back to Michigan. Finally, Mike & Gwen traded a Star Wars royalty check for a company-used Grand Voyager, taking possession just three days before the con—the fully-loaded trip to Columbus was for all practical purposes its test drive. With our first ever two hour concert slot, we had an opportunity to add something fresh to our usual repertoire. Much brainstorming was done, many lists were made. 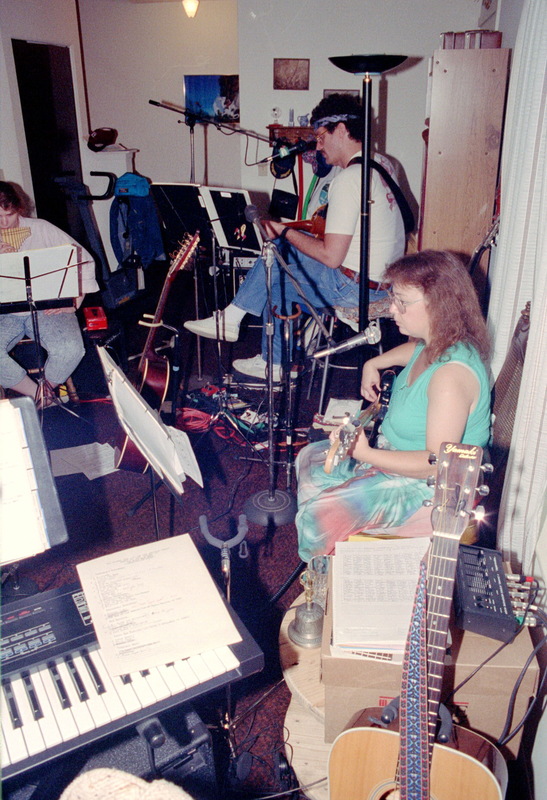 The easy decision was also the best one: the debut of Barry’s song cycle “Dream of a Far Light.” We also added “Rocket Man,” which Ed and Mary Ellen had worked up as a duet; Donna Hébert’s “Blessing,” likewise featuring Ed and Mew; The Indigo Girls’ “Galileo,” which the band considers a ‘found filk’; “The Story in the Storm,” another attempt at a ‘melty’ with Mike singing lead; and Jordin Kare’s filk classic “Fire in the Sky.” The result was an ambitious 21-song set, almost half of it new. “Harbors,” “Dragon,” and “Coming Back to Me,” among others, would take the night off. In keeping with the length of the set, the OVFF XIV concert program was our wordiest ever—eight densely formatted pages. Because every band wants their audience reading while the music is playing, right? 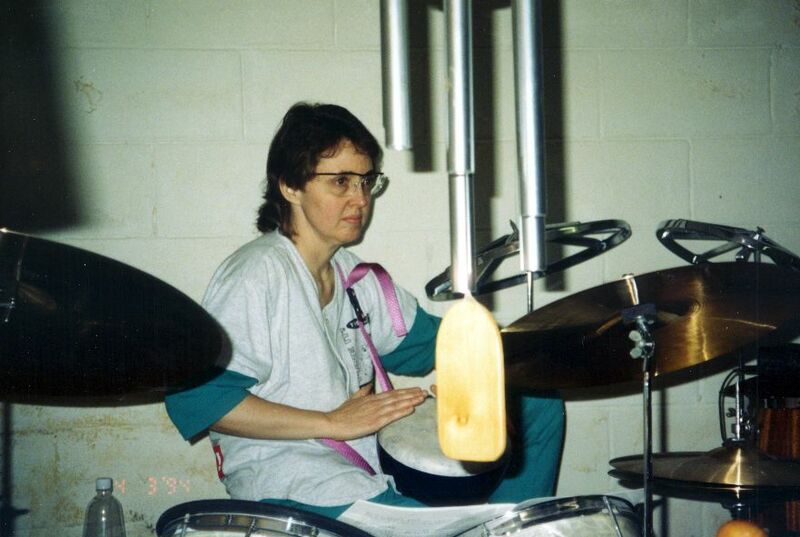 Inexplicably (at least at this writing), there are no known rehearsal tapes. We turned our mock concert into a full-up tech rehearsal with the new sound system we expected to use at the con, with Mike’s son Matthew at the mixing board. That ought to have included a test recording direct from the master mix. So, where is it? It’s a mystery. In any event, all our patch bay charts and mixing notes wouldn’t be needed. On arriving at the con, we discovered that Spencer Love had set up his own 24-channel rig for sound support and recording in the main concert venue. 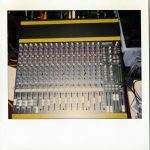 He proposed to record our concert and engineer the live mix; meanwhile, he would borrow our new Mackie for the weekend and employ it in one of the con’s smaller concert venues. 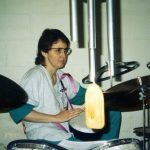 After a prospective gig at Conclave XXIX fell through, it was Barry’s determination that kept us on course for a second reunion concert. Bootstrapping from Mew & Ed’s selection as Duckon’s music Guests of Honor, we billed our concert as “Live and Unrehearsed”—because, fair warning. 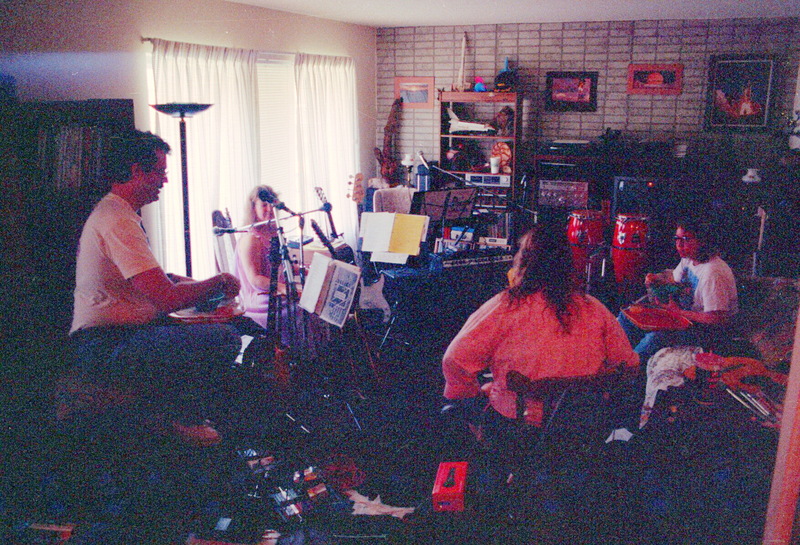 But there was a traditional BBB rehearsal marathon at Mike & Gwen’s two weekends before. 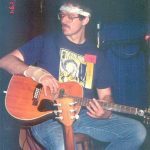 We knocked the worst of the rust off a 13-song set with a strong Greatest Hits flavor, 10 of them having appeared on First Contact. Gremlins made a bid to stop the show before it started. The night before departure, the fuel pump on Mike & Gwen’s Grand Voyager conked out, raising the prospect of another “3 of 5” concert. The gremlins were caged by family friend Greg Cronau, who was on his back on their driveway in a steady rain until 3:20am, dropping the fuel tank and replacing the pump. (The driveway still has a melted spot from the blowtorch that was required for the job. Yes, partially filled gas tank, blowtorch.) The Michigan contingent hit the road only three hours behind schedule. But that wasn’t the most unfortunate timing for this venture. Unbeknownst to the band, the most popular tradition at Duckon was the Saturday steak dinner buffet, with attendees lining up before the doors opened so as not to miss out. We didn’t know until after our concert that we had been scheduled opposite the buffet. 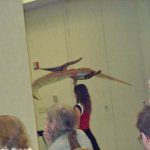 Our modest but appreciative audience was treated to Mike & Gwen’s children launching small foam pterodactyls into their midst during “I’m Rodan”—creating the rarest of all BBB souvenirs. Gavin also stepped into his older brother’s shoes as Pterodactyl Wrangler, running up and down the aisles with the giant inflatable. 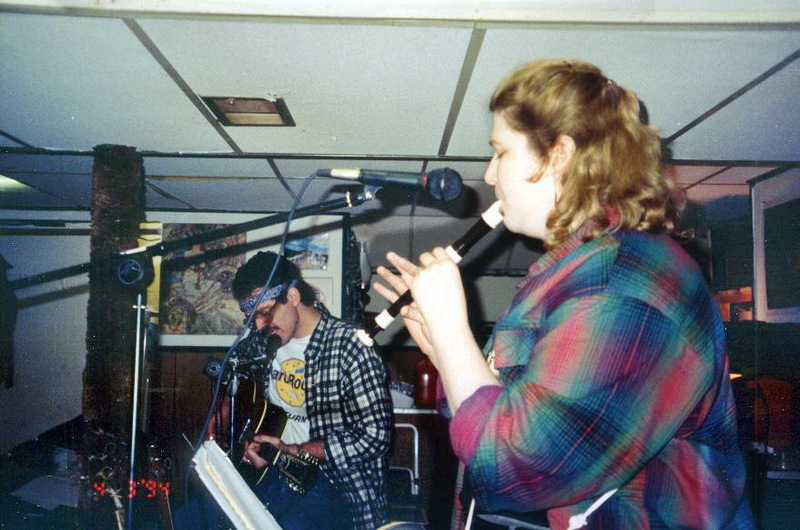 As of this writing, that was The Black Book Band’s last public performance. There are no known concert recordings from Duckon, so you’ll just have to take our word for it–we played brilliantly. Barry’s leads were never hotter, Mew’s voice was never sweeter, Gwen’s bass never punchier, Sally’s drumming never crisper, and Mike’s synth never louder. We hit all the entrances and exits cleanly, nailed all the harmonies, and finished the second encore before all the seats were empty. Good times. Each time one of you racked up 1 point or more, we were the winners. We’ve always been grateful for all our listeners, and so glad you could be part of The Black Book Band’s journey. The only thing better than making music together was sharing our music with you.